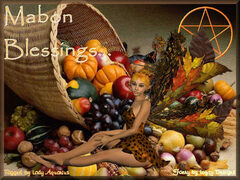 Mabon Sabbat occurs at Autumn Equinox, when the Sun enters the sign of Libra, usually around September 20 - 23. At Mabon, day and night are in equal balance for a moment in time. We are poised upon the threshold of the waning Sun. From now on the days will grow shorter and the nights longer. We are harvesting our crops; we are reaping what we have sown, both physically and psychically. Mabon is a good time to reflect upon, and appreciate the previous year. Because of the theme of balance, ideas of Karma, justice and tying up loose ends are appropriate. In the Wheel of the Year, the God journeys to the Underworld and the Goddess grows older, She misses the God and follows him to the Underworld. As she withdraws her power the land begins to turn cold and wither. Mabon Colors - Orange, Dark Red, Yellow, Gold, Indigo, Violet, Maroon and Brown. The Earth prepares for a great change. Light and dark are equal today, but that will not last. and takes us with it into the year’s dark half. in the night of the world. May they be good dreams. Mabon Sabbat is a time when day and night are in equal balance. At second harvest we turn our thoughts to reaping what we have sown in the previous months. This idea doesn't just apply to crops, it also applies to your thoughts and actions. Mabon is a good time to consider the Karmic effect of our actions, and to think about how we would feel on the receiving end. mistakes in our lives. Actions that we regret, that we carry around within ourselves cause blockages or Karmic attachments. Through prayer, and with the use of Karmic Ribbons we will heal those blockages. Hold the ribbon(s) in your hand and think about a situation or something that you've done that you regret. Think about who was hurt. What part of the situation was your responsibility? What do you need to heal? Imagine it clearly and have it strongly in your mind. send it to where it is most needed in this situation -with harm towards none and in accordance with the free will of all. As I tie my prayer(s) into the branches of this tree, I ask that my prayers shall be carried upon the wind –swift as thoughts and certain as rivers. May they be carried forward into manifestation as surely as the wind blows. As the flower gives rise to the fruit, and the fruit gives rise to the seed, so may this healing take effect. By my will and with Your aid –So Mote it Be! 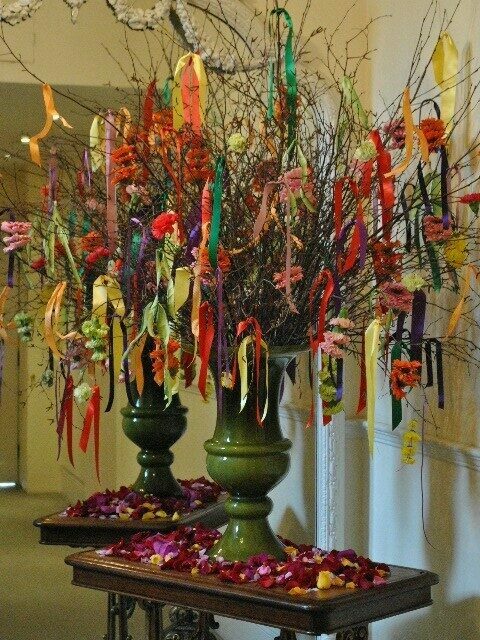 Immediately tie your ribbon(s) to the trees branches. Spend some time considering your light and dark traits and when you are ready write your light traits on one side of the leaf and your dark traits on the opposite side. Once sufficient energy has been raised direct it into your leaf,then crumble it up in your hands and release it into the wind. Behold the gifts of the ancestors. Their work is my blessing. Take a bite of the apple, savoring it……. For the nameless wonders of this sweet life, I give gratitude. And so the wheel of the year turns once again, within me and around me. Blessed be. Create a Mabon Blessing Tree. Gather some dried branches, and place them in a vase. Every day from September to Samhain write a blessing, prayer, petition or gratitude on a ribbon and tie it on to the Blessing Tree. At Samhain take the branches with ribbons still attached and burn on the Samhain bonfire.